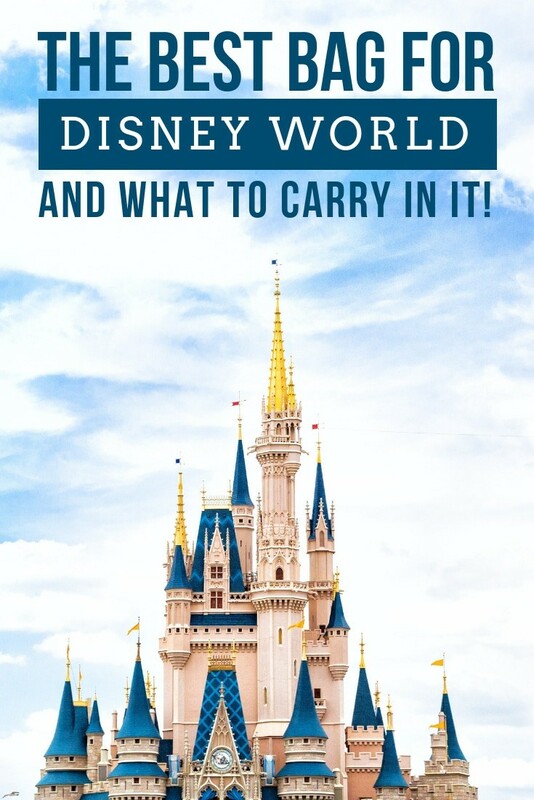 Today we’re sharing our thoughts on the best bag for Disney World and perhaps more importantly… what you need to put in it! Our insanely useful Disney packing list has been super popular with our readers and many of you have asked about our thoughts on the best bag for Disney World. So today we’re going to let you know which backpack we use, and perhaps more importantly give you some ideas on what you should carry with you to the themeparks! Oh and while you’re here be sure to check out all of our Disney World hacks to show you how to save time and money while on vacation! When you pick out a bag to use at the parks make sure you can carry it on your back or across your body, you’ll want your hands free to experience the fun and take pictures rather than carry a purse. You also want to make sure it’s not too big because you don’t want to feel like a pack horse carrying it about, and it needs to fit on the rides with you. You can of course rent a locker but that’s pretty expensive and you’ll need to keep going back to the entrance of the park whenever you need something from your bag. We like to save money on our Disney vacation by bringing our own picnic lunch to the parks so we use a cooler backpack just like this one. It’s insulated so it keeps our lunch and snacks nice and cool and there’s room inside for all the other bits and pieces we like to carry with us! If you’re on the Dining Plan or just want to experience the restaurants rather than brown bag your lunch then you can just use a regular backpack. One like this is a good option because it’s light weight and has lots of pockets and compartments for storing things. It also folds up into a little pouch so you can store it in your luggage when you’re travelling! The one type of bag we do NOT recommend you use is one of those drawstring backpacks (like these) because those string straps can really dig into your shoulders and get uncomfortable after a while! What should you put inside the bag? Want to know the number one item our readers put in their Disney bag? It’s the one thing you’d never think of but will be totally grateful for! There is a fine balance between bringing along the essentials you need to make sure everyone in your family enjoys the day and carrying everything but the kitchen sink – just in case. The parks are huge, and you will do a lot of walking, not to mention unless you’re visiting in the winter months it will also be hot and humid, so the last thing you want to do is act like a pack horse! Quart sized Ziplock bags – for keeping your smartphones and wallet safe from the rain or wet rides. They’re also useful for keeping the items coming up next organized inside your bag! Hand sanitizer – use it regularly throughout the day and especially before eating. Clorox wipes – Disney cast members are great at keeping places clean but if you snag a table in a quick service restaurant before they have a chance to bus it you might want to give the table a quick wipe over yourself! They’re handy for toilet seats too. Tissues – because you never know when someone might get the sniffles, or just a little bit emotional! Sunscreen – go for SPF 50+ even if you don’t usually wear any because the Florida sun is brutal. Lip Balm with SPF – don’t forget about your lips either! This lip balm keeps them nice and soft but also protected from the sun. Sunglasses – to protect your eyes from the glare . Ziplock baggies filled with snacks – granola bars and trail mix are great choices as they give you a protein boost and won’t melt. Lunch – if you are brown bagging don’t forget to pack your lunch! Refillable water bottle – Bottled water is expensive to buy in the parks, and you will need to drink lots of water to stay hydrated. This one has a filter in just inc case you don’t like the taste of Florida water! You can refill it from a fountain or ask at any restaurant for a cup of ice water which is still free but tastes better. Mini first aid kit – include Band-aids, Blister Band-aids and Tylenol in a ziplock to keep them altogether. Anything more serious than a scrape or a headache you can head to one of the First Aid centres. If you take medication for a specific medical need, like an inhaler or an Epipen, them make sure you bring those along too! Ponytail holders – if you have long hair carry some ponytail holders with you, because even if you don’t generally wear your hair up you will be glad of the reprieve from the heat. Just don’t forget to apply sunscreen to the back of your neck! Camera – if you still use one – with extra batteries and memory cards. If you plan to use your smartphone then make sure you have plenty of space and backup your photos to the cloud every day! Smartphone battery charger – to keep your phone fully juiced throughout the day because if you’re going to be taking photos and using the My Disney Experience App it will drain quickly. Don’t forget to carry your charging cord too! Pocket blanket – these blankets are brilliant because they are waterproof and large enough for a couple of people to sit on, but fold up so small they’ll fit in a pocket! Perfect for keeping your bottom comfortable while waiting for a parade or fireworks spectacular! Spray misting fan – these portable fans are a great way to cool off! Hat – to protect your head from the sun. Body glide – to keep your skin protected from chafing when you get a little bit sweaty! Gum – if you are a chewer you will need to bring your own gum as you cannot buy any at the Disney parks. Please dispose of it responsibly! A light layer to wear in the evening or in a table service restaurant. Visiting in the cold months? Bring a sweatshirt, hat and gloves to stay warm at the start and end of the day! A printed copy of your reservation references, Fastpass + times and touring plan, just in case your phone battery runs out! Don’t forget to check out our top picks of Disney shirt ideas to wear while you’re having fun at the parks! And make sure you don’t forget these all important items. Which we put in a different list because they might not actually go in your bag! MagicBand – if you are staying at a Disney Resort you will receive a complimentary MagicBand which acts as a key to your room. You can link your park passes and credit card to your band so that you can use it to enter the parks and use your Fastpasses and pay for food or souvenirs. If you’re staying in a non-Disney hotel you can still buy a Magicband to use in the themeparks so you don’t have to carry your tickets with you. Ooh and head over to Etsy to pick out a cute Magicband decal to decorate your band! Photo ID and credit card – you can use your Magicband to pay for things in the parks but you should still carry your card card because sometimes the charging systems don’t work. Before you leave home empty everything else out of your wallet or treat yourself to a Disney one especially for your trip! Smartphone – Download the My Disney Experience app before you leave home so you can keep track of your Fastpasses and dining reservations. I gave up carrying a camera to Disney years ago and just use my iPhone 6 to take pictures. If you want to use your phone just remember to make sure you have enough room for new photos and videos. It’s also a good idea to activate the daily backup to your cloud storage so you don’t lose any. Fitbit – this one is entirely optional but we love seeing how many steps we take going around the parks! If you wear your Fitbit remember to switch off the bluetooth to save battery power on your phone. Autograph books and thick sharpie marker – to collect autographs from the characters you visit with. Lanyard for trading pins – if you think your child would enjoy trading pins with cast members you might want to pre-fill the lanyard with low cost pins before you leave for your trip. Two mini M&M tubes filled with quarters and pennies – for the penny press machines. Glow toys and bracelets – when the lights go down the carts come out filled with glow toys, so save yourself some money by taking a stash with you! The glow bracelets are great for finding your stroller in the dark – just tie a couple to the handlebar. And they’re useful for helping kids feel braver on the dark rides! You can also use them as a nightlight in your hotel bathroom so you can find your way in the dark! Change of clothes – in case they want to play in the fountains, don’t want to stay wet after riding Splash, get covered in ice cream or decide they don’t want to wear their princess dress or costume anymore! Gallon ziplock bag – to hold the clothes they’re no longer wearing! Popsicle holders – to catch the inevitable drips from those Mickey Ears ice creams! Hat – to keep the sun off. Diapers and wipes – you can use the changing facilities in the restrooms but there are also dedicated Baby Care Centres in each park where you can change bottoms, heat baby food and watch cartoons in the cool! Bottle and formula – we always used these bottles when our kids were babies as they were really easy to use at the parks. Stroller fan – clip one of these to the side of your stroller to keep your little one cool in the heat. Selfie sticks! Yep, if you turn up at bag check with one of those you will not be allowed to take it in to the park with you. Before you travel make sure you check the official list of restricted personal items to see what other items you can’t take into the Magic Kingdom and other Disney parks.